It often starts with “What do you do?”, “Kamusta weekend mo?” or “Kamusta traffic sa area mo?” Then, eventually, this small talk turns into conversations revolving around families, hobbies and passions. And, in those moments where two people do nothing but simply talk about their lives and open up their souls to one another, good things happen. This is true for the two couples who started their relationship with a good conversation over Starbucks coffee. 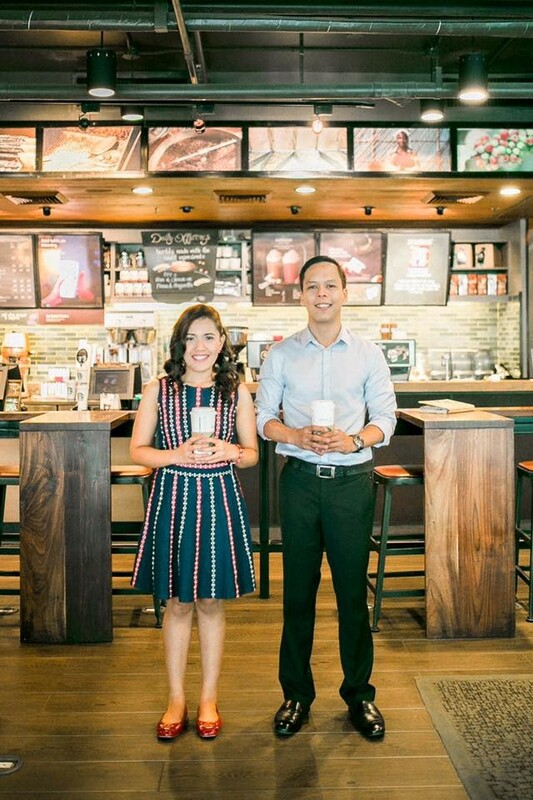 Alvin and Deborah first met at Starbucks, while study buddies Luis and Jet got to know each other better after a Starbucks coffee seminar. In 2013, Alvin invited Deborah to meet up at Starbucks i2 Point in Cebu after being introduced to each other through Facebook by a common friend. They talked for the first time over Java Chip Frappuccino®, Caramel Frappuccino® and a Cinnamon Roll. In less than a month, they made their relationship official. After three years, Alvin, a self-proclaimed poet, proposed to her through a 14-stanza poem. “I gave her one stanza of the poem every month during our coffee dates at Starbucks. It started on September 25, 2013, and went on for a year. After that, I never wrote her a poem again. I decided to fulfill my plan to propose to her last March 25, 2015 and created photo slides of us with each stanza of the poem in it, but now with the culminating stanza asking her to be my wife,” Alvin shared. 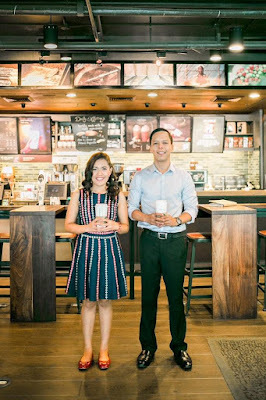 Last year, they had their prenuptial photoshoot at the Starbucks store where they first met. They are now married for eight months and expecting their first born very soon. Meanwhile, Luis and Jet’s story is a bit different. They were part of a study group that regularly met at Starbucks to review for the board exams. One Sunday after the exams, the two met again at Starbucks just to read books and spend alone time together, until a barista invited them to join a coffee seminar. They obliged and had a wonderful coffee experience by discovering the different growing regions and types of coffee. After the seminar, they got to know each other on a more personal level as they were able to talk more comfortably. “That same day, I came to know that he loves to go to the movies and dreams about being Batman. He also allowed me to share a laugh with him about his funny childhood antics, which I still laugh about to this very moment. The coffee experience loosens up people and makes them more comfortable, and I think this is why the term ‘COCOL’ (Coffee-Coffee Lang) also became popular,” Jet shared. They agreed to attend the following week’s coffee seminar, and the rest, as they say, is history. Now about to get married, they still remember that first time they had a good conversation and the friendly faces of the baristas who invited them to the coffee seminar. These, and more, happened at a place where people meet to bond and enjoy each other’s company. Starbucks, from the very start, has strived to be the third place between home and work – where one can form and keep meaningful relationships. And, in the spirit of encouraging meaningful connections over good coffee, Starbucks invites everyone to it's "Meet Me At Starbucks for a Date Night" event on February 14, 6-8PM at EVIA Daang Hari in Las Pinas and The Venice Grand Canal in Taguig and 7-9PM at Axis Entertainment Center in Cebu and E-Lopez in Quezon City. Live musical performances, food and beverage samples and special treat await you during the event. Celebrate love over a cup of your favorite handcrafted beverages and share your photos and stories at www.meetmeatstarbucks.ph – because good things happen when you get together. December 4, 1997, the Philippines had its first taste of the Starbucks Experience with its very first branch at the 6750 Ayala Building in Makati City. Starbucks has since won the hearts of the Filipinos. The opening of the 6750 Ayala store marked an important milestone in our history – the Philippines became the third market to open outside North America. The tradition of warm hospitality, constant need for connection, and love for coffee – these are the qualities that make Starbucks Coffee and the Filipino people a great culture fit.